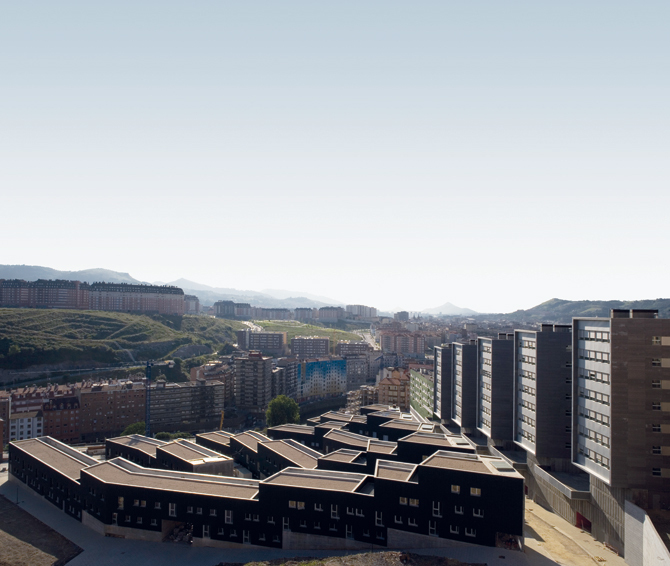 After being awarded first prize in the European 4 competition, the Basque Government commissioned our team to master plan the Mina del Morro zone. Dividing it in several parcels in order to make the development possible, eventually all of the plots were built independently, with mixed results in terms of its architecture. Out of the two parcels that define the core area, we were in charge of developing one, Parcel 4. The site is located at the edge of the Sagarminaga neighborhood, a heterogeneous set of residential buildings for working class people. The site is a steep terrain previously occupied by a mine, later abandoned, creating a no-man’s land between the Old Town and the outskirts, between the Nervión River and the hills, and between city and nature. Besides its ambiguities, which we found full of potential, the site could become the urban façade towards the entrance to the city from the highway. From the beginning, we were interested in its frontier character and in preserving its ambiguous and hybrid qualities. A comb-shaped footprint of several towers separated by lookouts works as a visual filter from the urban environment behind, generating a new façade for the city, introducing order and repetition. We proposed a low-rise, introverted, residential core surrounded by a taller perimeter dedicated to offices, amenities, retail areas, and civic buildings. The perimeter acts both as a connector to the neighborhood and the old road to San Sebastian, as well as a visual and acoustic barrier. On the other hand, the existing neighborhood, which is very dense, needed porosity, so two sun-filled squares with views were preserved with the open spaces between towers acting as urban lookouts. 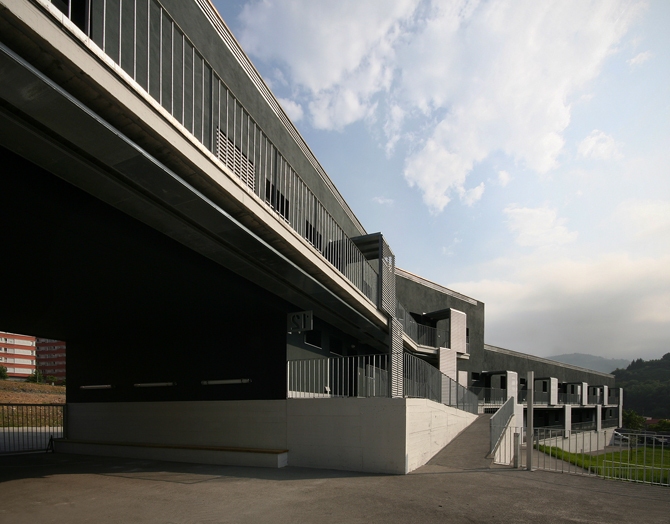 In the core of the cluster, the buildings rise from a carpet of green spaces and, around it, a ring-shaped road that gives access to the parking areas located under the peripheral buildings. 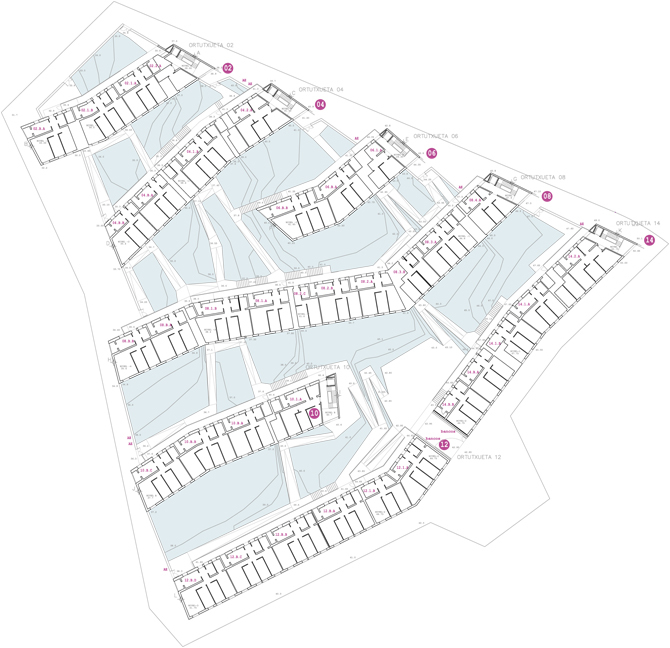 Parcel 4 includes six residential buildings that spill randomly throughout the hill, almost like a river, without subordinating themselves to parallel alignments, but controlled by a rational geometry. 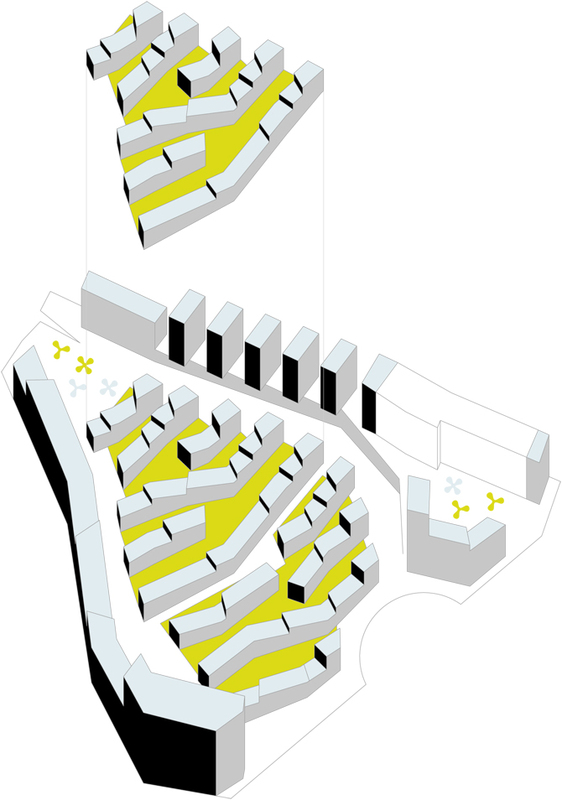 The buildings, following the idea of long-tiered-zigzag, generate a series of exterior voids that get narrower and wider, creating an intermediate scale of communal spaces. 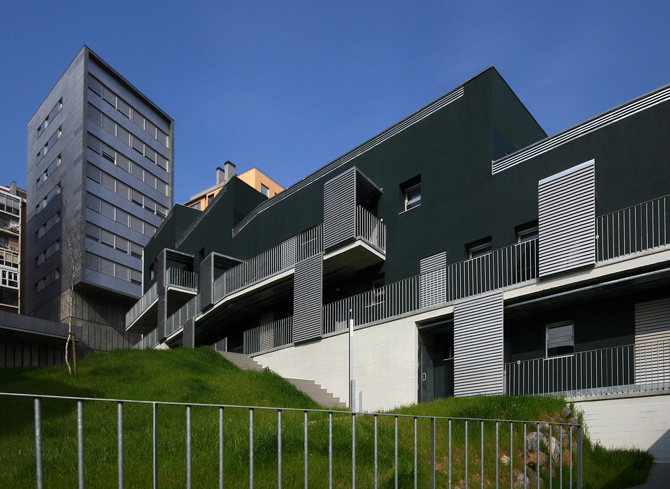 The mixed typology of the buildings combines the volume of the single-family row housing and the functionality of a social housing building with access through corridors. Each unit is accessed from the outside, with independence provided by its individuality, but stacked one on top of each other, using the collective logic. 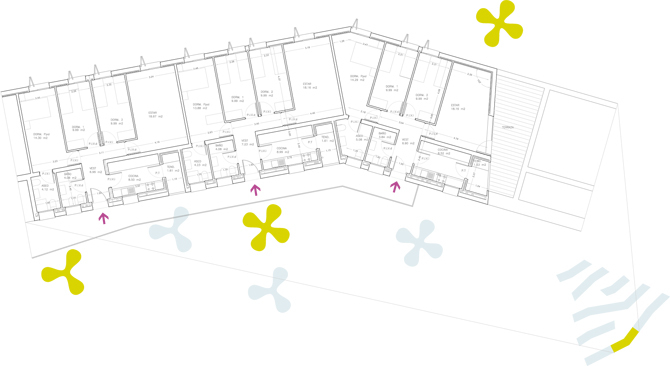 The longitudinal orientation of the building, approximately north-south, determines that the access corridors, where the entry halls, kitchens, laundry rooms, and bathrooms are facing, need to look north. The south façade, facing the ideal sun conditions and views, is then dedicated to bedrooms and living rooms. The plans are organized through a series of bands of different uses and characteristics: the exterior gallery for access; a technical wall cavity for mechanical ducts; a bay for service elements; and a final bay for living rooms. The zigzag and tiered geometry of the buildings maintains the vertical continuity of the different functional bands, but not of the residential units that are pushed apart horizontally from each other. The roofs are clearly visible from afar, so special care has been taken to define a fifth façade. 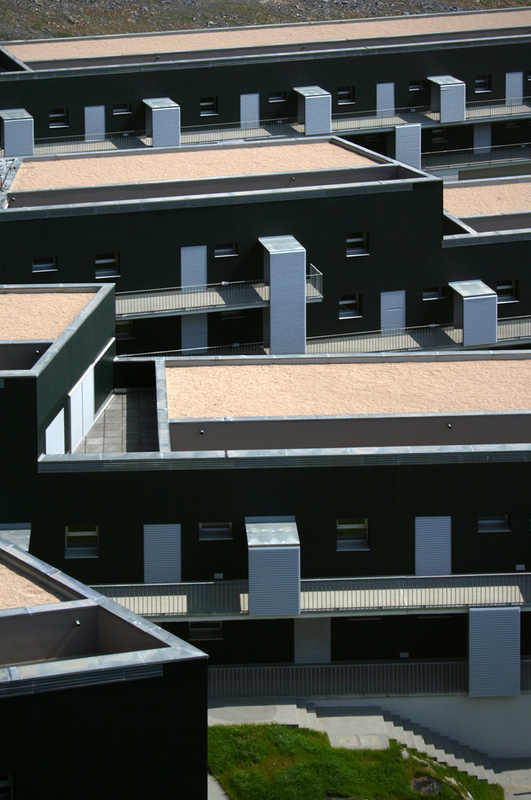 The roofs are either covered with pebbles or accessible by the residents without the presence of mechanical or other distracting elements typically present in these spaces. The open spaces make evident the steep slope of the site. 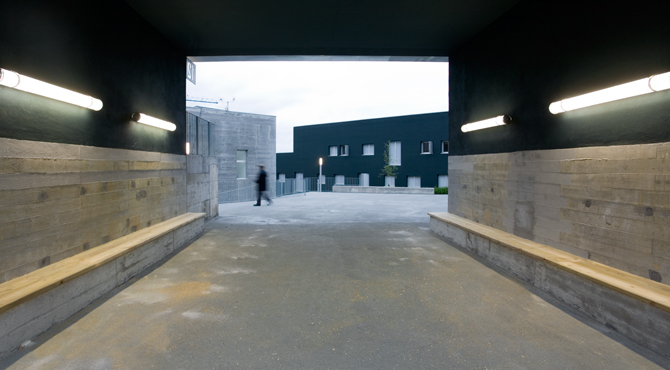 A braid of concrete ramps connects the entrances, vestibules, stairs, and galleries. The steeper areas are solved with embankments of stones extracted from the site while pouring the foundations that will ultimately be covered by moss. Large-scale deciduous trees will extend their shadow over grass tapestries, sand playgrounds, and hard surfaces with benches to be outdoors. • Authors: Eduardo Belzunce, Luis Diaz-Mauriño, and Juan García Millán. • Location: Ortutxueta 2, 4, 6, 8, 10, 12, 14, Bilbao. • Built Area: 8,545 m2. • Collaborating Architects: Daniel Vaquero, Carlos Revuelta, and César Patín. • Building Engineer: Juan Antonio Ramiro Garfella. • Construction and Administration: Eduardo Aguillo. • Structures: Fernando Rodríguez (Ferroestudio). • MEP: Alfredo Domarco, Pedro Soriano (HTEAN tecnología y edificación). • Photography: Elena Almagro and Aitor Ortiz. 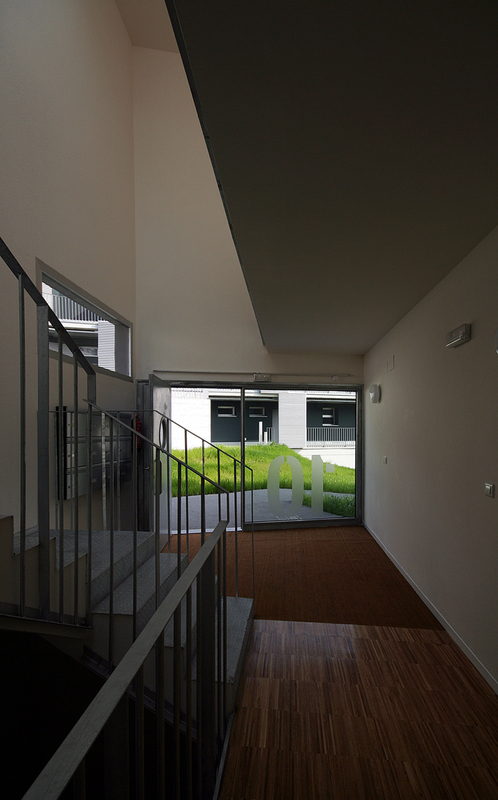 Eduardo Belzunce, Luis Diaz-Mauriño, and Juan García Millán are all architects who collaborate in different projects, including the Europan 4 architectural competition in 1996. Their proposal was awarded first prize, ultimately building eighty-four housing units in 2007 in one of the parcels of their masterplan. 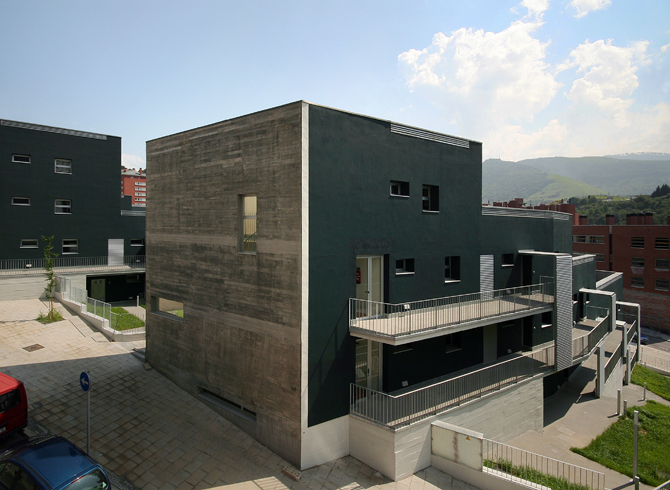 Eduardo teaches at the European University of Madrid School of Architecture. 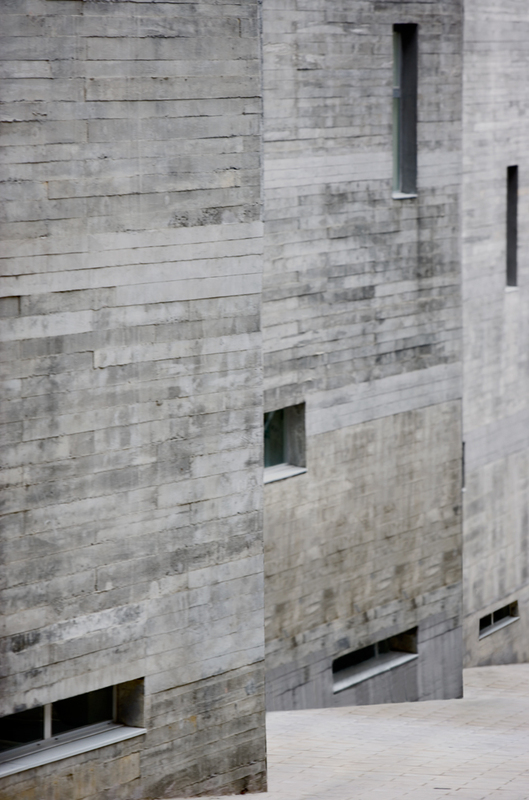 Luis teaches at the Superior Technical School of Architecture of Madrid (ETSAM). Juan is the founder and director of Ediciones Asimétricas and was editor in chief of Arquitectura magazine between 2000 and 2008.